A New Large-Bodied Oviraptorosaurian Theropod Dinosaur from the Latest Cretaceous of Western North America. 2014. Lamanna, M.C., et al. PLoS ONE 9(3): e92022. 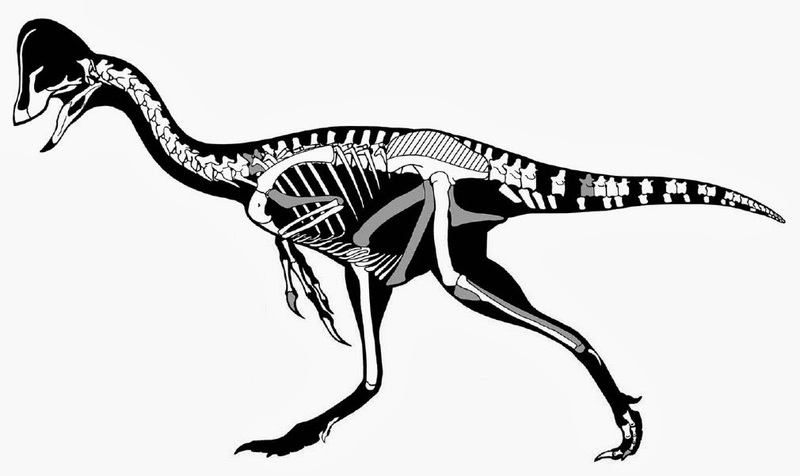 Abstract: The oviraptorosaurian theropod dinosaur clade Caenagnathidae has long been enigmatic due to the incomplete nature of nearly all described fossils. 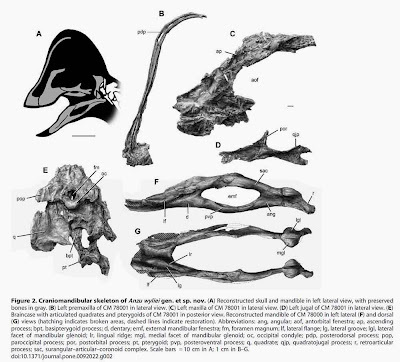 Here we describe Anzu wyliei gen. et sp. nov., a new taxon of large-bodied caenagnathid based primarily on three well-preserved partial skeletons. The specimens were recovered from the uppermost Cretaceous (upper Maastrichtian) Hell Creek Formation of North and South Dakota, and are therefore among the stratigraphically youngest known oviraptorosaurian remains. Collectively, the fossils include elements from most regions of the skeleton, providing a wealth of information on the osteology and evolutionary relationships of Caenagnathidae. Phylogenetic analysis reaffirms caenagnathid monophyly, and indicates that Anzu is most closely related to Caenagnathus collinsi, a taxon that is definitively known only from a mandible from the Campanian Dinosaur Park Formation of Alberta. The problematic oviraptorosaurs Microvenator and Gigantoraptor are recovered as basal caenagnathids, as has previously been suggested. Anzu and other caenagnathids may have favored well-watered floodplain settings over channel margins, and were probably ecological generalists that fed upon vegetation, small animals, and perhaps eggs.